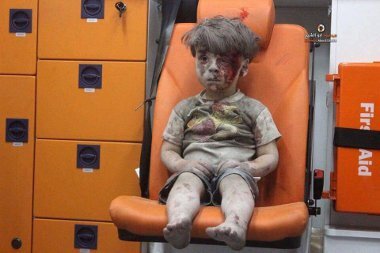 Recently, a compelling photo of a bleeding and seemingly confused young Syrian boy seated in an ambulance in Aleppo was widely distributed and commented upon in domestic and international news media. In response, some journalists have called for the Obama Administration to “take action,” including bombing government military targets in Syria. In the first two weeks of August alone there had been 143 civilians murdered by the majority Al Nusra Front mortar fire into western Aleppo, including 54 children and 23 women. This information was supplied to Vanessa Beeley by Dr Zahar Buttal, director of the Aleppo Medical Associationduring her trip to western Aleppo on the 14th August 2016. The tears started to drop as I took the photo. It is not the first time I’ve cried. I have cried many times while filming traumatised children. I always cry. We war photographers always cry. No, I think this photographer absolutely is known on Facebook, on YouTube for continually posting images, pictures applauding the Zinki militia, really a terrorist organization – well known even before this horrendous beheading of a Palestinian-Syrian child. He is not by any stretch of the imagination a human rights activist. He calls himself a ‘media activist’, but his role has been to applaud and support the terrorist activity in Syria. I would never work with any group that disagrees with my personal beliefs, but sometimes we have to take pictures with them,” adding “I normally take hundreds of selfies with whoever I see on the fronts. We who work in press take hundreds of pictures that we keep in our archives. The SEO is what it sounds like, a group of American citizens of Syrian extraction who have their offices on K Street in Washington, D.C., a street that is famous for being the center of the American political lobbying industry, with numerous think tanks, lobbyists, and advocacy groups based there. News reporting and media outreach have been among the major tasks that are vital to the civil uprising in Syria. Aleppo Media Centre, a specialized news center serving Aleppo and its suburbs, has been established with a generous contribution from SEO. Since October 2012, SEO has been responsible for coordinating Aleppo Media Center and providing technical and logistical help along with the financial help it provided. However, the SEO is not the only benefactor of this much relied upon media centre, embedded inAl Nusra-land. In December 2015, France’s own state media body, Canal France International (CFI) celebrated the fact that Aleppo Media Centre would be broadcasting over the FM radio airwaves of Aleppo, Idlib and Hama. Again, Idlib and Hama, along with East Aleppo – are also Al Nusra Front strongholds. Since 2012, the Aleppo Media Center, which has permanently brought together around twenty journalists based in Syria, has been providing continuous news coverage of the latest events affecting the region, with articles, photographs and videos being published on its website and on social media. In December, two members of the Center also received ‘trainer training’, which will allow them in turn to train citizen-journalists in Syria itself. Canal France International (CFI), the French cooperation agency and media operator of the French Ministry of Foreign Affairs, recently signed two substantial contracts (worth €2.7million) with the European Union to develop projects in support of independent media in the Arab world. The project will receive funding of €1.5million, including €1.2million from the European Union(EU). The overall goal is to enable a new generation of Syrian journalists to produce high-quality, professional information today and to become pillars of the post-crisis media in the future. In April 2014, CFI will open a media centre, the Syrian Media Incubator, in the Turkish city of Gaziantep, 60km from the Syrian border, to the north of Aleppo. This collective workspace aims to provide modern telecommunication tools and support Syrian journalists who are determined to continue relaying news from their country, whatever the cost. This admission by the French government is truly spectacular. Let’s examine that statement: France and the EU, hardly impartial observers of the war being waged against Syria by the US and its allies in NATO, the Gulf States and Israel, are funding and supporting a media outlet that is whipping up the propaganda storms at strategic points in the battle by the Syrian Arab Army, to liberate Aleppo from the claws of the US coalition terrorist gangs. Their stormshave sufficed to distract public attention from the real atrocities being committed by the terrorist entities against Syrian civilians in Aleppo and to once more invoke the clamour for a No Fly Zone, the ultimate tool that is needed by NATO to reduce Syria to a Libya style failed state. As a reminder, CFI already works in partnership with International Media Support (IMS) and Reporters sans frontières (RSF), and, in particular, helped in 2013 to set up an independent Syrian radio station called Radio Rozana, which broadcasts from Paris and relies on a network of 30 correspondents based in Syria. CFI provided several training sessions for these correspondents in 2013. The second contract signed with the EU will enable CFI, over a period of three years, to fund projects seeking to develop online information services in Algeria, Morocco, Tunisia, Libya,Egypt, Jordan, Palestine, Lebanon and Syria. In this way, as the Arab world continues to evolve rapidly, CFI is redoubling its efforts to support the independent media that is destined to play a major part in the fragile processes ofdemocratisation taking place. The French Ministry of Foreign Affairs and International Development (Ministère des Affaires étrangères et du Développement international – MAEDI) has set CFI the task of implementing its policy of aid for the development of public and private media and, more generally, the audiovisual industry with a tri-media outlook, in countries in receipt of development aid. Its goals include the dissemination of information [propaganda], the strengthening of civil society and the State of law, and support for new democracies or ‘fragile States’“. It has the backing of France Télévisions and Arte France, ensuring service to a professional standard. One of the co-founders of Aleppo Media Centre is Zein Al Rifai, along with Youcef Seddik. In aninterview with ‘Syria Deeply’, another one of the myriad of newly formed media centres working to foment propaganda against the Syrian state and national army, Al Rifai responds to questions with the now familiar soundbites and outright lies. In July 2012 everything changed. But it was not the residents of Aleppo who rebelled against the rulers. Parts of the city were invaded by armed groups with fighters from other areas of Syria and from other countries. Tony Sayegh believes that the interests at stake of the invasion was much bigger than the control of a single city. The attempt to overthrow the government of Syria with weapons and riots had failed. Then they decided to focus on Aleppo, to turn against the whole Syrian economy. The armed groups took over the water utilities and power plants to stop the supplys to the residents, and they focused on the industries. Entire factorys were taken down and driven to Turkey. They stole everything. That was when everything turned upside down and the bad days of Aleppo began. We maintain good relationships with most of the opposition factions. We all share the same goal: to liberate Syria from tyranny, but each of us has taken his or her own path to achieve it. We have covered areas controlled by Jabhat al-Nusra in both Aleppo and Idlib. They did not bother us at all. These same Syrian embedded and satellite mainstream media outlets are liberally bandying around the Hitler label for President Assad, a cheap demonization device that they and theirSMART power teams have regularly employed for other regime change targets – Muamar Gadaffi(Libya), Saddam Hussein (Iraq), Slobodan Milosevic (Yugoslavia/Serbia) to name only a few.